You’ll know that you’re in the exact right place as soon as you see the lady in the cowboy hat – standing next to a mountain of golden pig legs – which have been slow stewed into tender perfection. That’s the lady in the cowboy hat you’re looking for! If you ask me, it’s really quite an intelligent street food move, standing out with that signature cowboy hat! 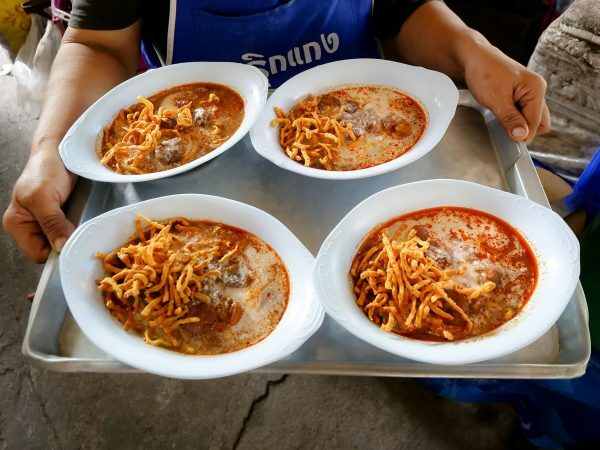 The stall is named Khao Kha Moo Chang Phueak (ข้าวขาหมูช้างเผือก) – the name of the dish served, khao kha moo, plus the location at Chang Phueak, the north gate in Chiang Mai. Is that an intestine she’s pulling out of the pan? Every evening, starting at about 5 pm or so, you’ll find the lady in the cowboy hat happily pulling delicious pig legs (and some other pig parts, as seen in the photo above). Anyways, Khao Kha Moo Chang Phueak (ข้าวขาหมูช้างเผือก) is a really famous street food stall in Chiang Mai, and one evening I headed over to try it out. I was there by about 5:30 pm and already most of the tables were filled and there were about 8 or so people ordering takeaway. She quite an impressive pot of kha moo (pork legs) and what’s on display, and there are even bigger pots of pork sitting on the side waiting for later. 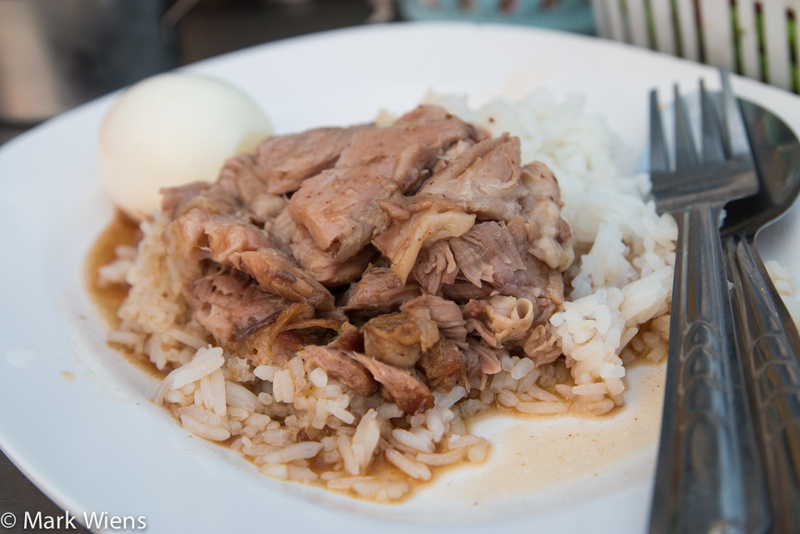 I ordered just a single plate of khao kha moo (ข้าวขาหมู), pork leg over a plate of rice. 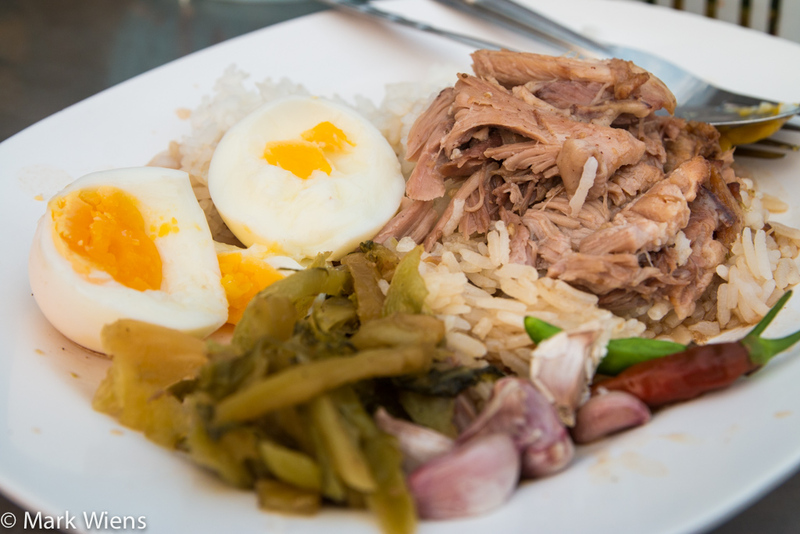 While some plates of this Thai dish come with a little bit of stewed kana (Chinese broccoli) on the side, this came pretty bare bones – just rice topped with pork and a hard boiled egg on the side – straight to the good stuff. All you can eat chillies! On the table though, you could add your own chilies, cloves of raw garlic, and pickled mustard greens (known in Thai as pad gat dong ผักกาดดอง). Normally when you order khao kha moo (ข้าวขาหมู) it will come with a little extra fat on the meat. But for myself since I’m not a huge fan of chunks of blatant fat, I order mine “mai ow nang” (ไม่เอาหนัง) so that I didn’t get any skin, but just more of the pure meat – a lot less fatty and hopefully a bit more healthy. 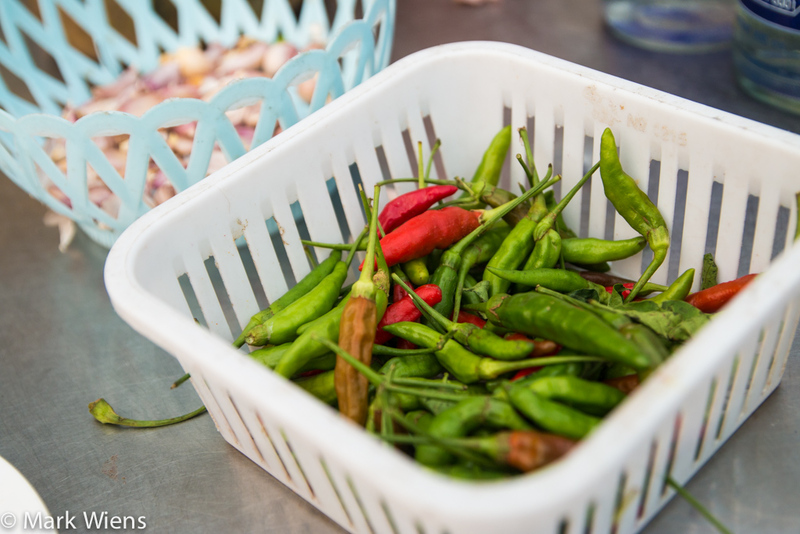 I enjoyed the self service chilies and raw garlic, actually the raw garlic, for me, is what really complements a plate of khao kha moo (ข้าวขาหมู). The pork was just fall apart tender and the texture was smooth and beautiful. It was really tasty, packed with accents of cinnamon and star anise, and I liked that it wasn’t as sweet as other versions I’ve had occasionally in Thailand. The hard boiled egg on the side, with bits of pork, is always a good idea, and the raw garlic and chilies also added that extra kick of flavor. I would say this was a fine plate of khao kha moo (ข้าวขาหมู). 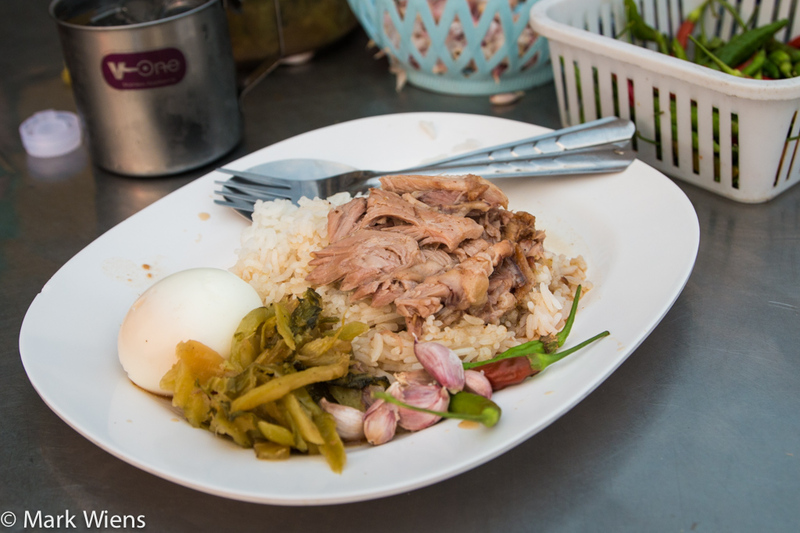 Khao Kha Moo Chang Phueak (ข้าวขาหมูช้างเผือก) is so famous in Chiang Mai for a reason… it’s really good. The pork itself was extremely tender and very flavorful and I especially liked that it wasn’t as sweet as it is sometimes. The chili vinegar also tasted wonderful on the pork. 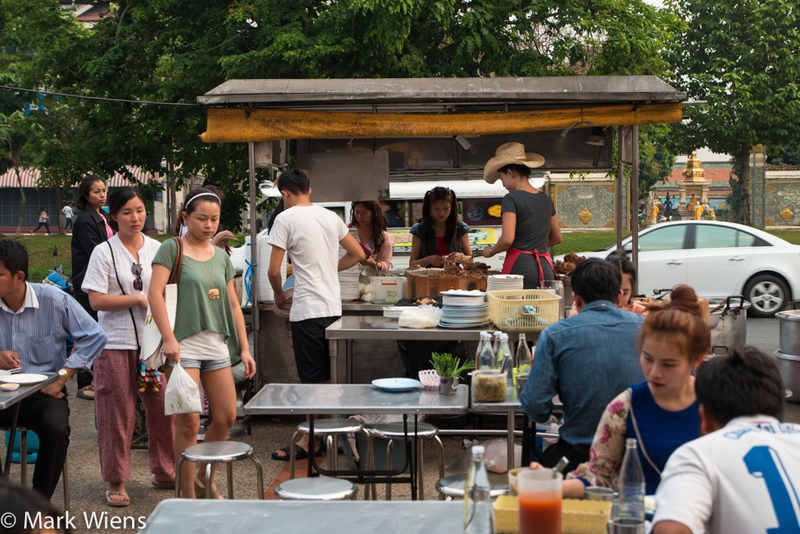 If you like khao kha moo (ข้าวขาหมู) and you’re in Chiang Mai, you’ve really got to eat here. 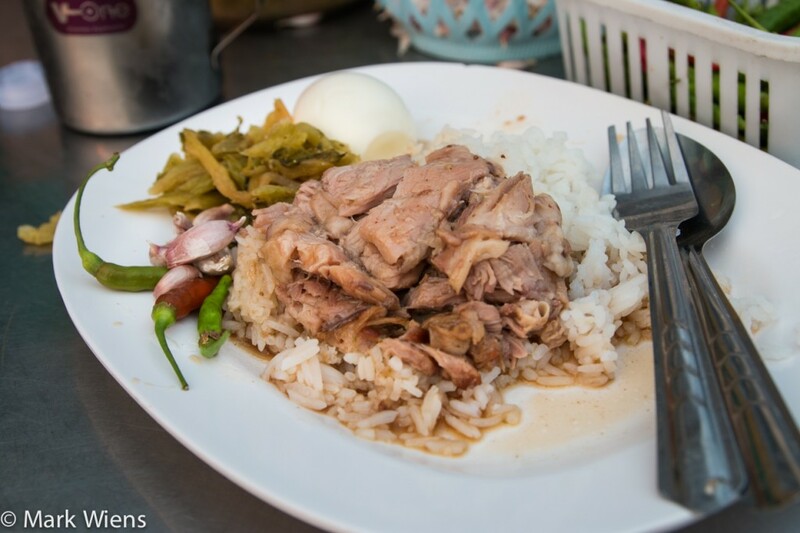 เปิดบริการ 17.00 – 02.00 น.
Khao Kha Moo Chang Phueak (ข้าวขาหมูช้างเผือก) is located across the street from Chang Phueak, which is the north gate of the old city of Chiang Mai. 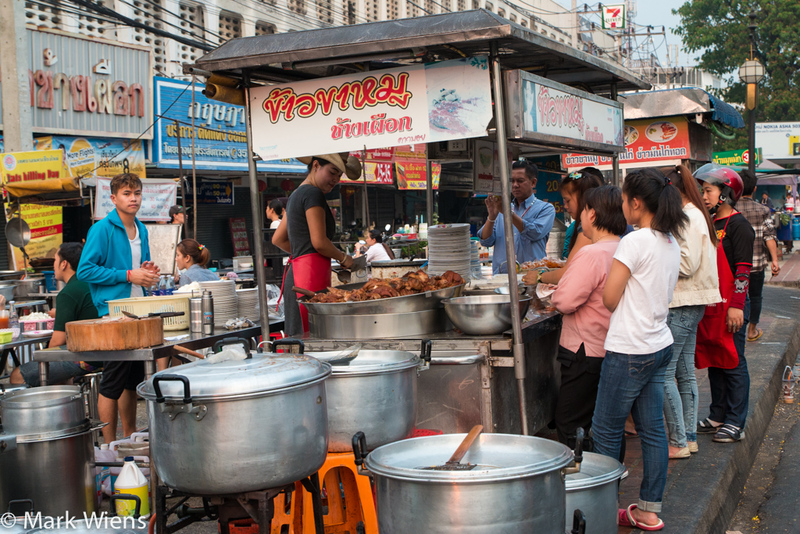 There’s a cluster of street food stalls that opens in the area each evening, and you can’t miss it. Looks like I’ll be going here for dinner tonight. It’s been too long and only a KM from my house. Came here a year ago and it was one of my favorite meals on my month long trip. Just left Chiang Mai. Ate here the first evening in town based on your recommendation. It was every bit as good as I had expected. A friend from BKK and I walked the entire perimeter of the old city after the meal. We ended up right back here and had a second helping. Thanks for all you do Mark! Hey Bobby, great to hear from you, glad you enjoyed the braised pork leg! Have been dying to try this out since I saw your vid. Finally went tonite and what a disappointment it was. I’ve had better in Bangkok. It was bland, bordering on tasteless….we had to keep piling on the chillies, garlic and salted veg just to make it taste….perhaps our cowgirl should step up or hang up her cowgirl boots! Sorry to hear about that Hsu, have you tried Charoen Saeng Silom? 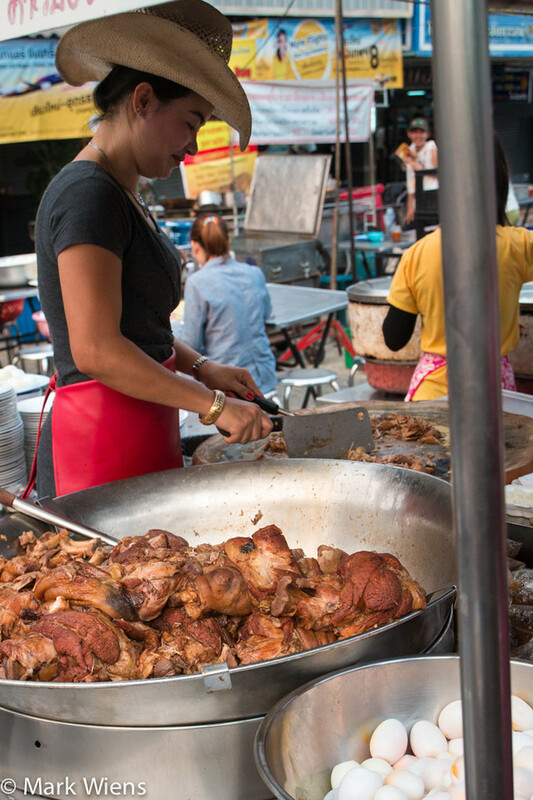 You should go check the old dude who sells khao kha moo from his pushcart at the start of Sukhumvit Soi 8….. His stuff is off the hook! Usually sold out by early afternoon. 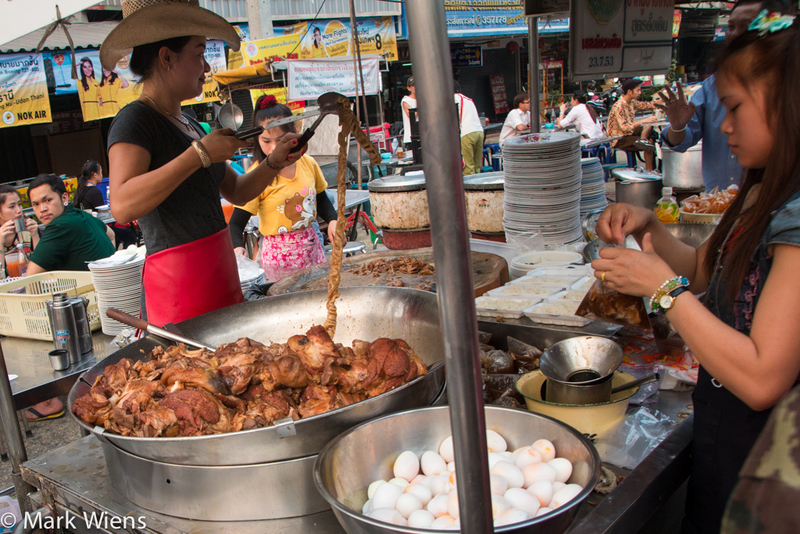 I visit thailand in 3 weeks, my food itinerary is already sorted – thanks to your blogs! I have noticed whole “sweet garlic” cloves seem to be a popular garnish; is this completely different from standard european garlic? As i can’t imagine chewing a clove of that! Hi Craig, good to hear you’re coming to Thailand soon, glad the posts here are helpful. 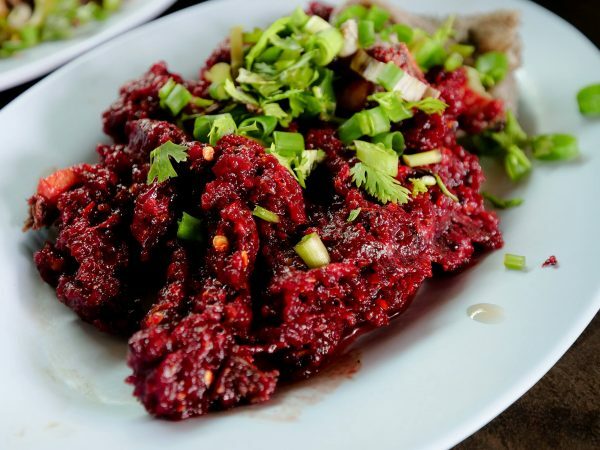 Yah, especially at a restaurant like this served with khao kha moo, they call the garlic “Thai garlic,” and it’s still pungent, but doesn’t burn so much. You’ve got to try it, so good! Great idea, we went for the second time to Thailand and the second time to Chiang Mai, the lady with the cowboy hat is still there, and even in the pouring rain, you can eat very well there, just don’t forget your umberella. @Mark, great guide, most of the restaurants we go to come from your guide! Hi Junky, great to hear from you, glad you enjoyed this place and stayed dry while eating. Thank you for getting my guide as well, really appreciate it. Are you living in Thailand, or visiting? Let me know if you have any questions! I have been spending waaaay too much time on your websites, on your YouTube channel (subscribed!) and reading and re-reading your e-books. But: quick question! Is there an e-book about Chiang Mai? I am bookmarking everything, but downloading it all in one package would be so much simpler. Hi Lynn, sorry for the late reply. Thank you very much for reading my blogs / ebooks, and watching my videos. No, as of now, I don’t have any other guides about Chiang Mai, but hopefully in the future I will try to make one. Thank you again, hope you’re having a great time and have a good trip to Bangkok and Yangon. Hi Sven, great to see your recipe, it looks delicious! Hey Justas, thanks for sharing, a thank you for the correction, will change that now. Awesome…….thanks Mark. 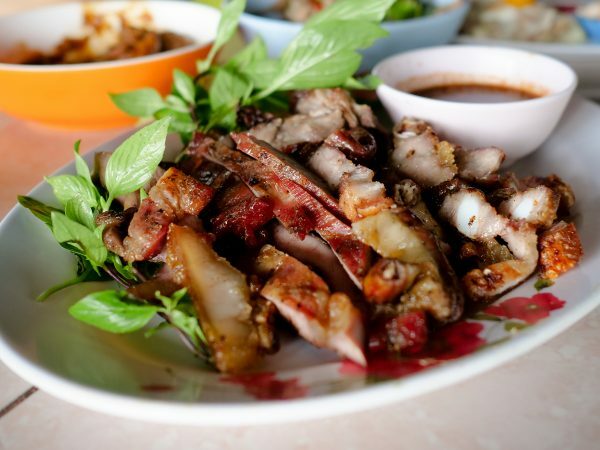 I love pork leg and we can’t get anything like this here in Australia (that I know of) and do miss it from when living in Phuket previously. The mustard greens give so much flavour and goes well with the pork, sauce & rice. I’ve added it to the list of places to try when we’re in Chiang Mai later this year. Thanks for the tip Mark! Hey Trent, good, glad you love pork leg too. This place serves up one of the better versions I’ve had in a long time, you’ll enjoy it for sure!